Château Les Carmes-Haut-Brion's house sits perched atop some of its vineyards. French real-estate mogul Patrice Pichet has purchased Château Les Carmes-Haut-Brion for €18 million (about $24 million), setting a record for vineyard land values in Bordeaux. The estate includes 11.6 acres of vineyards in Pessac-Léognan (just one block from first-growth Château Haut-Brion), a 7.4-acre park and a 19th century castle. It produces 1,600 cases of red wine per year. “It’s very expensive, but it’s in the heart of Bordeaux,” said Hervé Olivier, director of SAFER, the French property and rural development agency, which monitors all land sales. 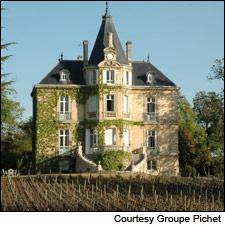 Pichet told Wine Spectator that he estimates the house to be worth between $2.7 million and $3.3 million. Depending on the value of the park, that puts the approximate price of the Merlot, Cabernet Franc and Cabernet Sauvignon vineyards somewhere between $2.7 million to $4 million per hectare (1 hectare is roughly 2.4 acres). The vineyards were once part of Haut-Brion, and Pichet is only the third owner since the estate was created in 1584, when Haut-Brion’s owner bequeathed the land to Carmelite monks (thus the name “Carmes”). After the French Revolution, it passed into the hands of ancestors of the Chantecaille-Furt family, who built the castle and landscaped park. Pichet, whose privately-held company posted revenues of $551 million last year, is moving ahead quickly on state-of-the-art cellars, replacing the outer wall with a more inviting wrought-iron fence and changing the postal address so it will become the only château in Bordeaux city limits. Stéphane Derenoncourt will remain as consulting enologist. Thierry Rustmann, former co-owner of Château Talbot and current owner of Château Beau-Soleil in Pomerol, will guide the operation for a year or two as a technical consultant. While this is Pichet’s first château purchase, he’s already partnered in a real-estate agency, Pichet-Rustmann, dealing exclusively in vineyards. Rustmann handled the yearlong negotiations with owner Didier Furt and his family. Furt and his wife owned 60 percent of the shares, with the remaining shares held by other family members. Not everyone in the family wanted to sell. A bidding war with the Dillon family, owners of Château Haut-Brion, drove up the price. A Very Bold Move! I think with such an expensive purchase this is not about ROI its about passion and great wine in a historic region. Good Luck.